As the future mega cities become populated by massive skyscrapers, human activity will spread upwards. Here I illustrate an unfinished construction site between skyscrapers. 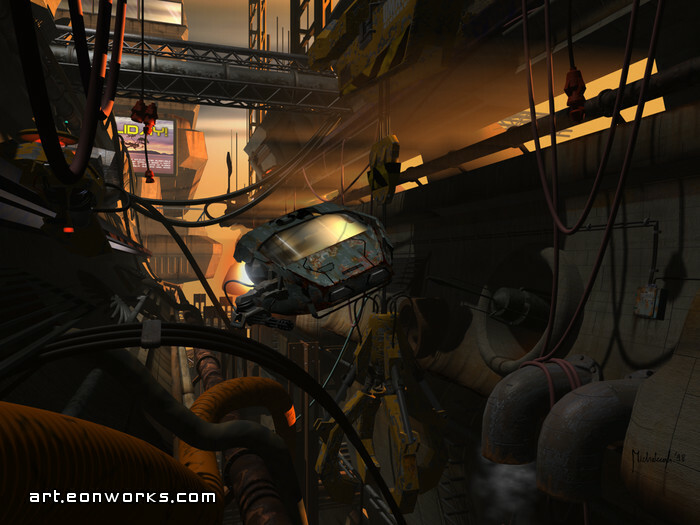 "Future bandits" was my first attempt at making something serious in 3DS Max. The plan was to make a cyberpunk art image depicting a Sci-Fi future scenario. I started working on it in 3DS Max 1.2 and ended in Max 2. My main source of inspiration was a large construction site just outside the game studio I worked at. Every day on my way to and from work I would look for some new interesting aspects of it. The site was changing constantly and was full of useful visual reference. I even took pictures of some machines and all kinds of construction hardware and junk - cool stuff. I worked on this image over a period of about 3 months, mostly during weekends. "Future bandits" was awarded first place at an international 3D rendering competition, The Gathering'98, held in Norway. The extra cool thing is that I still receive emails from people telling me how this image inspired them to become a CG artist - which is always nice to hear :) See how this image was created. You do on a PC what many studios have a team of artists to work on. Fantastic!! "All units,we have a runaway flying vehicle,he entered the construction site"Lol.Love the artwork,epic! Very cool! Looks like a scene from a cyberpunk movie. Must have taken ages to make. And this one is also my favourite work of yours! Keep it up! A vision of a future shown in a cyberpunk style that reminds me of Blade Runner. I love this! Your images look so real its unbelievable.